Chrissie Swan started an interesting conversation on her Facebook page recently. 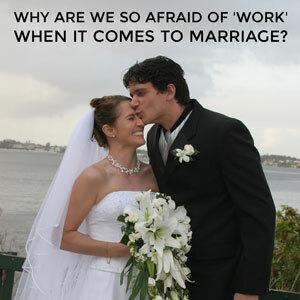 Is it just me… Or am I only one who doesn’t think relationships/marriage takes ‘work’? I can’t think of a less appropriate word to describe my relationship. Work? No. Not a bit. Anyone else see the problem I’m seeing with the above? The idea that a relationship should always ‘just kind of flow’? This is not just unrealistic, it also sets us up for failure. Now, don’t get me wrong. The best relationships (and when I say ‘relationship’ from here on, I’m talking about the one with your significant other) do, for the most part, flow. But the reason they do so is because we’re willing to do the work when things get hard. And given these ‘significant other’ relationships span many, many years, things will get hard at some stage. One person will consistently (usually unwittingly) say or do something that upsets the other. One person will pursue something that is very energising and fulfilling for them … but requires the other person to put their own dreams on hold for a while. One person will feel a little neglected or unloved leading everything the other person does or doesn’t do to be viewed through that prism. Stick your head in the sand and assume everything will sort itself out in the end. I’ve lost count of the hard conversations I’ve had with Ant over the course of the 20 years we’ve been together. But I can assure you that we wouldn’t be together today if not for those conversations. We started going out when we were 17. Can you imagine how much we’ve both evolved as people in that time? Can you see how much our priorities would have changed? Can you see how unrealistic it is to expect that there be no hard work involved in ensuring the lines of communication between us remain open enough to have a great relationship? So let’s get back to the word ‘work’ now. To suggest something doesn’t take work suggests it is effortless. I can’t think of anything worthwhile in my life that is effortless. Maintaining my mental health at a level that allows me to be happy takes work. Writing and running, the two things that make me ‘me’, take (a LOT of) work. Having my household running smoothly takes work. Being a good mum, friend, daughter, sister, boss, etc – all take work. Being a good wife and having a good marriage, for me, takes work. It involves having hard conversations when I’d rather go to bed and sleep it off knowing we’ll both have ‘gotten over it’ by the next morning (until the next time that is). It takes understanding Ant’s personality and needs – and how these differ to mine. It takes both of us holding each other accountable and to high standards when it’d be much easier not to. You can call it ‘effort’ or ‘understanding’ if you like, but I’m going to call it ‘work’. Because being willing to ‘do the work’ is the gift I give to all the things in life that are important to me. And it’s a gift I’m proud to give to my marriage. ** Please note, the above is me talking about … me. I’m not suggesting for a second that if a marriage has ‘failed’ it’s because the two people in that marriage haven’t been willing to ‘do the work’. If two people are fundamentally unsuited to spending the rest of their life together, no amount of work will change that.